Monica E. Peek, M.D., M.P.H., M.Sc. 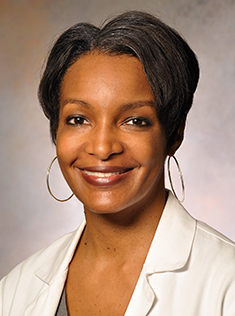 Dr. Monica Peek is an associate professor in the Section of General Internal Medicine at the University of Chicago, where she provides clinical care, teaches, and conducts health services research in the area of health disparities. Dr. Peek is the associate director of the Chicago Center for Diabetes Translation Research, where she heads the Health Disparities and Community-Based Participatory Research Core. She is an inaugural faculty fellow of the Bucksbaum Institute for Clinical Excellence, whose goal is to promote positive patient/physician relationships. Dr. Peek is the Director of Research at the MacLean Center for Clinical Medical Ethics and the Executive Medical Director of Community Health Innovation for the University of Chicago Medicine. As a Greenwall Faculty Scholar, Dr. Peek is exploring shared decision-making between African Americans and their healthcare providers. She received her M.D. and M.P.H. from The Johns Hopkins University and her M.Sc. from the University of Chicago. Dr. Peek has authored more than 65 peer-reviewed research papers and publications and has served as the principal investigator of grants from NIH/National Institute of Diabetes and Digestive and Kidney Diseases, the Robert Wood Johnson Foundation, and the Merck Foundation to improve patient-provider communication, shared decision-making, diabetes care, and health outcomes among racial/ethnic minorities and other vulnerable populations. Dr. Peek was named one of the “Top 40 under 40” in Chicago by Crain’s Business Magazine and has been ranked among Chicago’s Top Female Physicians. Her work has been featured in national media outlets, such as TIME and ESSENCE magazines, CNN, the Melissa Harris-Perry Show, and HuffPost. In 2013, she received the Outstanding Junior Investigator Award from the National Society of General Internal Medicine. Dr. Peek has served as an American Cancer Society medical ambassador and as a board member of A Silver Lining Foundation, the Chicago Black Women’s Health Alliance, Project HOOD (Helping Others Obtain Destiny), and the Greater Chicago Food Depository. She is a recent member of the editorial board for the journal Health Services Research and a National Advisory Council (NAC) member for the Agency for Healthcare Research and Quality (AHRQ). Dr. Peek currently serves on the national council for the Society of General Internal Medicine.